Tayler is passionate about the intersection between permaculture design and regenerative small business. 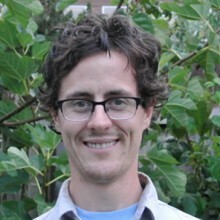 With his wife Solara, Tayler runs Hatchet & Seed, an edible landscaping & ecological design business, founded in 2010. From the installation of a demonstration forest garden at a Music Festival Site in Northern Saskatchewan, to edible landscapes surrounding the LUSH corporate head office in Vancouver, to dozens of residential backyards and public orchards in Victoria, Hatchet & Seed offers professional edible landscaping solutions. Understanding that we still need large farms to produce staple crops to feed us, Tayler is also active in the world of regenerative agriculture, under the mentorship of Regrarians’ founder Darren Doherty. With a 3 year Keyline Water Management Pilot Project funded through the BC Climate Action Initiative, Tayler and his team are monitoring the effects of ‘keyline plowing’ on treated vs. untreated pasture, as well as developing farm consultancy tools to help producers design their farms as integrated landscapes that are better suited to climate impacts. With diversified training and experience in permaculture, organic horticulture, ecological landscape design, rainwater management, project management, and farm planning, he is passionate about sharing his knowledging and pursuing further education. Tayler and his family live at Eco-Sense (one of Canada’s “Greenest Homes”) with builder’s Ann and Gord Baird, where he is learning what it means to live a lifestyle tied to grey water systems, solar energy, wood gasification, rainwater collection and living buildings.